The quote is taken from the very end of the book, “In Season, a Louisiana Falconer’s Journal”, by Matthew Mullenix. It is in reference to a friend’s approach to a sporting endeavor. After reading Matt’s journal, I see parallels between his approach to falconry and Kent’s approach to cycling. I have made an attempt at simplification and keeping it cheap and real. I bought a Kogswell P/R and built it up with a fixed wheel. In the community of equipment obsessed bicycle geeks (at least), it is a modest machine. It is easily adequate for my needs. If I were to spend less time browsing the internet for cycling content and more time riding, I’d be fitter, stronger, more skilled, and have better stories to tell. But I tend to entertain myself a bit by admiring the tools of some of my friends, while neglecting their fine technique. 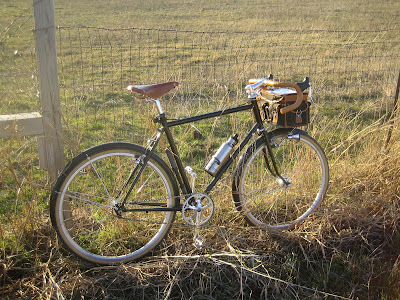 Now my Kogswell, is equipped with a front rack and luggage that is arguably not “cheap and real”. …I seem to remain highly susceptible to the siren call of “lugged and pretty”. Nothing wrong with lugged & pretty. Of such appreciation comes art. My problem is that I enjoy art for pure aesthetic reasons AND enjoy the whole form-follows-function ethic. Sometimes I wonder if life would be easier if I weren't so internally conflicted. I have often wished I could go "cheap and real" like Kent. Luckily my income limits how much I can spend on the expensive stuff. I don't know about Real, but my bikes are Cheap. And beautiful, at least to me if to no one else. Hey, Matt, loved the book! My wife bought the book for me, and I was only mildly interested. But you are a skillful story teller, passionate about your craft, and I was totally absorbed. Thanks for writing the book. And thanks for stopping by.